Heat oven to 425°F. Combine thyme and pepper; reserve 1 teaspoon seasoning mixture for sauce. Press remaining seasoning mixture evenly onto all surfaces of beef roast. Place roast on rack in shallow roasting pan. Insert ovenproof meat thermometer so tip is centered in thickest part of beef. 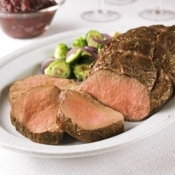 Roast in 425°F oven 50 to 60 minutes for medium rare; 60 to 70 minutes for medium doneness. Meanwhile prepare sauce: Combine vinegar and shallots in small saucepan; bring to a boil. Reduce heat; simmer 3 minutes. Stir in cranberry sauce; bring to a boil. Reduce heat; simmer 6 minutes to blend flavors, stirring occasionally. Remove from heat; stir in reserved seasoning and salt.